A breakfast that’s so addictive I dream about it every night! 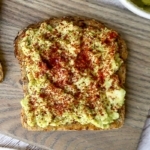 Not only is this smoky avocado toast with miso recipe simple (5 ingredients) and quick (8 minutes total), it’s also packed with goodness and flavors that punch way above their weight class! 1 teaspoon gochugaru (Korean chili flakes) optional but highly recommended! Peel the avocado and take out the pit. Mash in a bowl with a fork and set aside. Toast the bread in a toaster until golden brown (I use the #3 on my dial). Spread 1/2 tablespoon butter on one side of each slice and 1 teaspoon miso paste on the other side. In a pan over medium high heat, place the bread slices, butter side, down. Toast for 1-2 minutes, until you get a nice crispy top, and flip the bread over. Toast for 1 minute and transfer to a plate. Spread equal amounts of avocado on each slice and sprinkle gochugaru on top. Season with a little salt if necessary – miso is quite salty on its own – and serve. Optional – serve with an egg on top for a more substantial meal. This recipe is adapted from Candice Kumai’s miso avocado toast.